Senior fall prevention is an important topic because as you age, your health and the medications you take make you prone to more falls. This is why falls are one of the leading causes of injuries among older adults. Fear of falling doesn’t have to rule your life since there are some things you can do to easily prevent them. Prescription and over-the-counter medications and supplements may increase your risk of falling. Your doctor will want to review these with you and possibly wean you off sedatives and certain antidepressants. 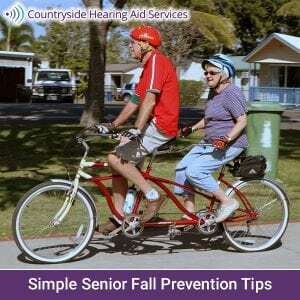 Any falls you’ve had are important to discuss so together you can identify specific senior fall prevention strategies. Your health conditions may make you prone to falling, especially if you have eye or ear disorders. How comfortable you are walking and whether you feel any dizziness, joint pain, shortness of breath, or numbness in your feet or legs while doing so is just as important as your muscle strength, balance, and gait. Physical activity can also help with senior fall prevention – especially walking, water workouts, and tai chi. These activities improve your strength, balance, coordination, and flexibility so you’re less likely to fall. You should tell your doctor if you’re avoiding these types of activities because you’re afraid they’ll make you more likely to fall. Your doctor may suggest a carefully monitored exercise program or refer you to a physical therapist who can create a custom exercise program that will improve your balance, flexibility, muscle strength, and gait. You may need to stop wearing high heels, floppy slippers and shoes with slick soles. These are known to be slippery. Wearing properly fitting, sturdy shoes with nonskid soles won’t only help you not fall but they can also reduce your joint pain. Also make sure to use a nonslip mat and a bath seat in your bathtub or shower. An occupational therapist can help you find senior fall prevention strategies that are easily installed and relatively inexpensive. You have less environmental awareness of people, pets, and other things that are happening around you. Spatial awareness (where your body is positioned in relation to other people and objects around it) decreases. Cognitive overload is a hindrance to your balance. In other words, when you suffer from hearing loss you use more of your mental resources to hear and interpret speech and other sounds so you have fewer resources left to help you maintain your balance. This is why you should have your hearing checked by Countryside Hearing Aid Services each year. They can also help you find a great hearing aid that will help you maintain your hearing and lessen your likelihood of falling. Today’s hearing aids are virtually invisible, rechargeable and offer effortless, transparent hearing and speech clarity. Give us a call at 727-796-1161.